You Have Eevolved Into Jolteon! Jolteon is the eeveelution of energy. It is lightning fast, powerful, and does not take no for an answer. It is fiercely loyal, and after that loyalty has been earned, it will go out of its way to prove it. By getting Jolteon, it means that you are very transparent in your emotions. You are aggressive and driven in all of your pursuits. This certainly isn’t a negative quality! When faced with a “fight or flight” situation, you will often rather use your intuition and skills to fight, instead of fleeing the scene. You don’t play the victim when unwarranted, and you are honorable in your everyday life. You may sometimes be the aggressor – but in today’s world, that is often the quality needed most. Once an Eevee has been exposed to a Thunder Stone, it evolves into a Jolteon. Jolteon made its maiden appearance with the infamous trainer Sparky in The Battling Eevee Brothers, an episode of the popular Pokémon TV show. It also played an important role in The Ultimate Test against Ash, our main protagonist, when he was to take the Pokemon League Entrance Exam. Jolteon also showed its versatility in Get Along, Little Pokemon, where it was utilized by trainer Ethan to lure escaping Magnemites. Jolteon’s other notable appearances include 1) Espeon, Not Included and Trouble’s Brewing, alongside one of the Kimono Sisters; 2) The Eighth Wonder of the Sinnoh World!, as used by leader Volkner in his battle against Ash [Spoiler: It lost though against the Ash’s Infernape! ]; 3) Team Eevee and the Pokemon Rescue Squad!, together with other eeveelutions (and an Eevee itself!) — this Jolteon was owned by trainer Virgil; 4) Eevee and Friends, as a partner to Sylveon and council to Eevee; 5) Mystery on a Deserted Island. Jolteon also boasts a plethora of other minor appearances, seeing as it is a first-generation Pokémon. Where a cute Eevee may be huggable, you may want to stay away from hugging Jolteon. One look and you know that it means business – nasty business. Its prickling fur gives a good idea as to its primary strength, which is its cells’ ability to generate electricity. Jolteon may not be emanating lightning, but coupled with the static electricity generated by its fur, you wouldn’t want to be anywhere near it when it starts dropping thunderbolts. 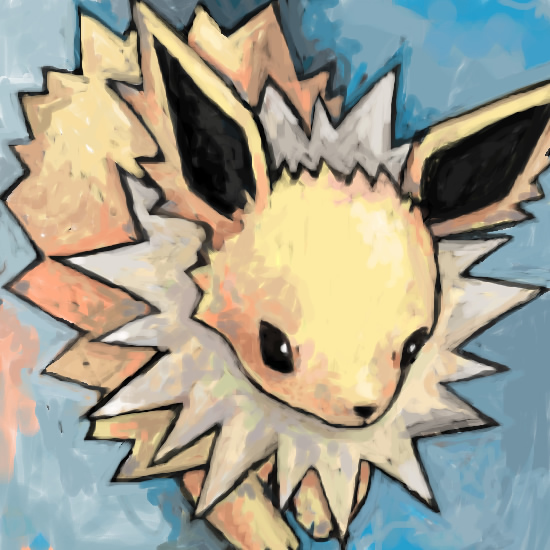 By the way – a Jolteon’s fur is not just fur. It looks like it is made of needles because it is made of needles. Or, more specifically, it’s made of needles charged with electricity. That said, Jolteon is literally surrounded by its type, and is rightfully categorized under the Lightning category. Generally Jolteons are 2 feet and 7 inches tall, weigh an average (and compact!) 54 pounds. A fan may think of it like a bulldog. As far as personality is concerned, Jolteon is canine, and has the air of a fierce coyote. If you’re facing a Jolteon, don’t hit it with any electric-type moves — you’ll be helping it! Any electricity restores its health (or HP) thanks to Jolteon’s Volt Absorb ability. Again, you wouldn’t want to hug this Pokemon. But to an aspiring trainer, this powerful eeveelution is a fantastic choice!